Who invented the Stapler? The invention of the stapler developed over many years and several different names of inventors are associated with the evolution of the stapler. The names of these inventors include Samuel Slocum, George McGill, Charles Henry Gould, Albert J. Kletzker, Henry R. Heyl, William J. Brown, Jr. The involvement of all of these inventors are detailed in this article. Charles Henry Gould's invention is seen as a direct predecessor of the stapler although William J. Brown, Jr's invention is the first "modern" stapler. Evolution of the Stapler: The first staplers were 'Single Staple Machines' which did not take strips of staples, and only held one staple at a time requiring re-loading after each use. The first device that we would recognize as a "modern" stapler was invented William J. Brown, Jr. of Philadelphia, Pennsylvania. Definition of the Stapler: The Stapler is defined as a small machine or mechanical device that inserts staples into sheets of paper. A staple is a very short, thin, straight piece of wire with two short right-angled end pieces which are driven by a stapler through sheets of paper to fasten them together. Fact 1: Who invented the Stapler? The Stapler was invented by Charles Henry Gould in 1868 during the Second US Industrial Revolution era of inventions (1850 - 1914). Fact 2: Who invented the Stapler? Paper was invented in Ancient China during the Han dynasty (206 BC - 220 AD) but did not reach Europe until 1150. Paper remained an extremely expensive commodity for many years. Fact 3: Who invented the Stapler? The Industrial Revolution and the emergence of paper mills made it possible to produce cheap paper. Fact 4: Who invented the Stapler? The rise of commerce during this period in history resulted in masses of loose sheets of paperwork. And people began to look for ways of fastening sheets of paper together without damaging the document. Fact 5: Who invented the Stapler? Prior to the invention of the Stapler personal, ornate wax seals were used to fasten sheets of paper. From the 1690's Great Britain and the American colonies legal, and other official, bureaucratic sealed documents were rolled and bound with red tape - hence the expression "red tape" that we still use today. Fact 6: Who invented the Stapler? Pins were often used to bind documents together but they damaged documents and were unreliable. Another option was to glue papers together. Fact 7: Who invented the Stapler? In 1841, an American pin maker called Samuel Slocum (March 4, 1792 - January 26, 1861) patented his design for a "Machine for Sticking Pins into Paper" (Patent number 2275, dated September 30, 1841), but his device wasn't a stapler, it was a machine for packaging pins and a fastening method that consisted of threading pins through paper. Despite this fact, many have erroneously claimed that Samuel Slocum was the inventor of the first stapler. Fact 8: Who invented the Stapler? In 1866, the American inventor George McGill received U.S. patent numbers 56,587 and 67,665 for small, bendable brass paper fasteners and for a press to insert the fasteners into paper that he called the McGill Single-Stroke Staple Press. The device weighed over 2½ pounds and loaded a single ½ inch wide wire staple, that was able to drive through several sheets of paper. Fact 9: Who invented the Stapler? George McGill demonstrated his invention at the 1876 Centennial Exhibition in Philadelphia, Pennsylvania where he received a medal for his inventions. Various styles and sizes of pin heads were available and were suitable for binding papers, cottons, woolens, silks etc. Fact 10: Who invented the Stapler? In 1868 Charles Henry Gould received a British patent for a wire stitcher in which the pointed ends of the wire were forced through the paper and the ends folded down. Fact 11: Who invented the Stapler? Charles Henry Gould's device has been acknowledged by many as a direct predecessor of the stapler. Fact 12: Who invented the Stapler? The earliest staplers did not take strips of staples, they only held one at a time and had to be re-loaded after each use. They are referred to as 'Single Staple Machines'. Neither did the early Single Staple Machines clinch into place. Fact 13: Who invented the Stapler? In the same year as Charles Gould's invention, 1868, Albert J. Kletzker from St Louis, Missouri also patented a device he referred to as a paper clip. His invention used sheet metal rather than wire. The machine inserted the fastener without clinching it, the points of the fastener had to be bent in with the fingers. Fact 14: Who invented the Stapler? Henry R. Heyl, of Philadelphia, Pennsylvania, received US Patent No. 195,603 on September 25, 1877 for an "Improvement in devices for inserting metallic staples". His invention consisted of a machine, in the form of a stationary anvil with a rising arm, by which a metallic staple was forced through sheets of paper documents, and secured by clinching the legs on the reverse side. Fact 15: Who invented the Stapler? The first device that we would recognize as a "modern" stapler was invented William J. Brown, Jr., US 1882 Patent No. 260,365, and made by the Jones Manufacturing Company. Their 'Star Automatic Fastener' as a self feeding staple machine that used a long strip of bendable staples that were wired together. Fact 16: Who invented the Stapler? The E.H. Hotchkiss Company, owned by George Hotchkiss and his son Eli Hubbell Hotchkiss, acquired the Jones Manufacturing Company and re-branded the 'Star Automatic Fastener' as the 'Hotchkiss No. 1' in 1898. Fact 17: Who invented the Stapler? The Hotchkiss No. 1 Automatic Paper Fastener used a single strip on which there were 25 staples. The staples could be used to fasten up to 25 sheets of paper, and with the same movement would feed through the next staple. Fact 18: Who invented the Stapler? 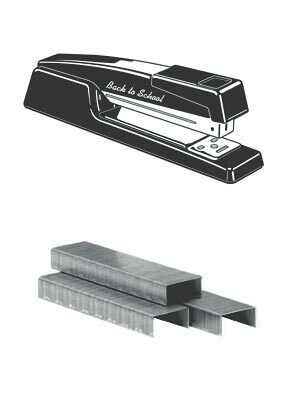 The Hotchkiss stapler was so popular that people began referring to a stapler as a 'Hotchkiss'. The Hotchkiss company introduced their product to Japan and the Japanese, having no word for such an object in their language, named the device after the brand name which is why, in Japanese, the word for 'stapler' is "hochikisu". Fact 19: Who invented the Stapler? The pioneers of paper fasteners all ended up taking each other to court numerous times over patent arguments and the confusion regarding the actual inventor of the staple continues to this day. Fact 20: Who invented the Stapler? The evolution of the stapler continued into the 20th century and witnessed the development of staplers that swung open, allowing easy loading. Fact 21: Who invented the Stapler? The stapler remover was invented in 1932 by William G. Pankonin of Chicago, Illinois, patent number US 2,033,050. Fact 22: Who invented the Stapler? The Automatic electric stapler was patented on October 10, 1967, patent number US3346163, by George E. Manganaro. Who Invented the Stapler - Inventor - Invention - Stapler Definition - Meaning - Famous - Important - History - Timeline - Innovation - Significant - Development - Office Equipment - First - Definition - Kids - Facts - Information - Info - Who invented the Stapler? - Dates - When - Why - Impact - Purpose - Use - New - Old - Amazing - Best - Definition - Meaning - Awesome - Cool - Stapler History - Stapler Timeline - Who Invented the Stapler?